Chester, a pug dog from Vermont, received an online MBA "for life and career experience" (for a flat fee of $499) from Rochville University, an online college that is not accredited by a recognized accrediting agency. Chester is the mascot for GetEducated.com, a consumer advocacy group that works to protect distance learners from online degree fraud. The ease with which the dog nabbed an MBA highlights the growing worldwide problem of online college diploma mills and degree mills, a billion dollar industry, says GetEducated CEO Vicky Phillips. Chester Ludlow, a pug dog from Vermont, has been awarded an online MBA (Masters in Business Administration) by Rochville University--an online college that offers distance learning degrees based on life and career experience. Chester is believed to be the first dog to be awarded a college degree based on life experience. But did he earn it--or did he buy it? "The difference between earning a college degree online or buying one is key," says Vicky Phillips, founder of GetEducated.com, a consumer group that reviews and rates online colleges and works to protect consumers from diploma mill fraud. In May, Chester submitted his resume--along with $499--to Rochville University online. A week later, on June 5, 2009, an express packet arrived from a post office box in Dubai. It contained Chester's MBA diploma, two sets of college transcripts, a certificate of distinction in finance, and a certificate of membership in the student council. The paperwork says the pug "earned" a GPA of 3.19 (for an additional $100, he could have graduated with honors). All documents were issued in the dog's AKC pedigree name: Chester Ludlow. Chester also received a Rochville University window decal for his car (though reportedly the canine does not drive). Rochville University is one of scores of online universities operating from foreign post office boxes that advertise college diplomas fast for a flat fee. The university claims accreditation by the "Board of Online Universities Accreditation" and the "Universal Council for Online Education Accreditation." The catch? Neither of these agencies is recognized as a college accreditor by the U.S. Department of Education or the Council of Higher Education Accreditation. "It matters which agency accredits your online college," explains Phillips. "Want to ensure your fellow alumni aren't real dogs? Make sure your online college is accredited by a recognized agency." 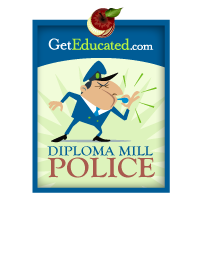 To help combat credential fraud, GetEducated.com operates a free service, The Diploma Mill Police. This service allows consumers to verify the accreditation status of any online college. It also helps employers screen resumes for fraudulent college credentials. "Degree mills represent a billion dollar industry worldwide," warns Phillips. "If you define a degree mill as any agency willing to award educational credentials without concern as to whether or not learning actually occurred, then it appears Chester the pug has been the victim of a degree mill." 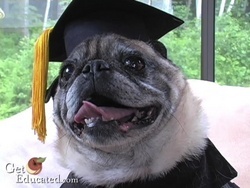 Chester is currently starring in GetEducated.com's educational video: "Dog Earns Online MBA: A Cautionary Tail." In this video, Chester and his sidekick Bixby, a rescue puggle, dramatize the canine quest for credible online education. The video has been produced by GetEducated.com to help online students understand the importance of college accreditation and to warn them of the rapid spread of online college degree mills. About: Founded in 1989, GetEducated.com is a consumer advocacy group that reviews, rates and ranks online colleges along the dimensions that matter most to consumers: cost and credibility.